Back in 2011, about two years after Ernesto Perez-Carrillo ended his nine-year tenure with General Cigar to establish his own family-operated boutique, he introduced the Elencos Series. This three-vitola line had the same blend as the E.P. Carrillo Edición Limitada 2010, and its production was likewise limited by the availability of the requisite tobaccos. Elencos is Spanish for “cast,” as in the cast of a theatrical production. It is offered in the same three formats as it was in 2011 with prices in the $8.25-9.25 range: Don Rubino (5.25 x 50), Elites (6 x 54), and a figurado called Acto Mayor (6.25 x 52). The first shipments of the line are expected to start arriving at retailers later this month. As you may have noticed from my pictures, the attractive, intricate band of silver, black, and red says “Elenco,” not “Elencos.” Lissette Perez-Carrillo confirms the name of the line remains “Elencos” and that the bands and boxes are being corrected as such. I smoked several Don Rubinos for this review. This robusto-sized smoke has a dark, oily wrapper that’s devoid of any large veins or imperfections. It is firm to the touch, yet the cold draw is clear. The pre-light notes are rich and reminiscent of molasses and nougat. After an even light is established, the profile is incredibly full-bodied right from the get-go. The bold, spicy flavors include espresso, black pepper, cayenne heat, and dark cherry. The texture is thick and syrupy. Then, about a half inch in, the strength pulls back a bit and additional notes of sweet cream and roasted nuts help add balance. Towards the midway point and beyond, the cigar mellows further. It’s still medium- to full-bodied, mind you, but the flavor is more balanced and harmonious, and a thick, syrupy sweetness combines with the roasted nuts to help offset some of the heavy-handed pepper and espresso. The construction is flawless. 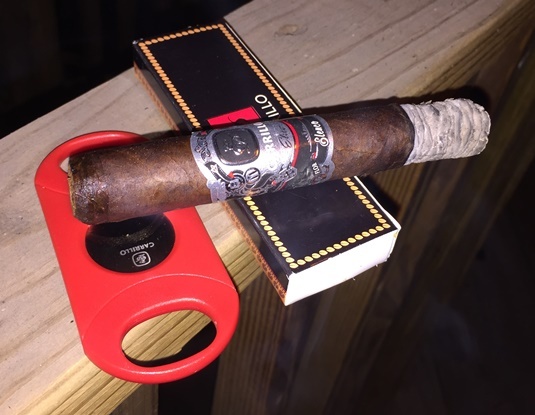 The gray ash holds well, the burn line is straight, and the smoke production is excellent. The Elencos Don Rubino from E.P. Carrillo packs a ton of bold flavor and Nicaraguan strength for just north of $8. I recommend seeking it out, especially if you crave a rather intense experience. In my book, it earns a very solid rating of four stogies out of five.